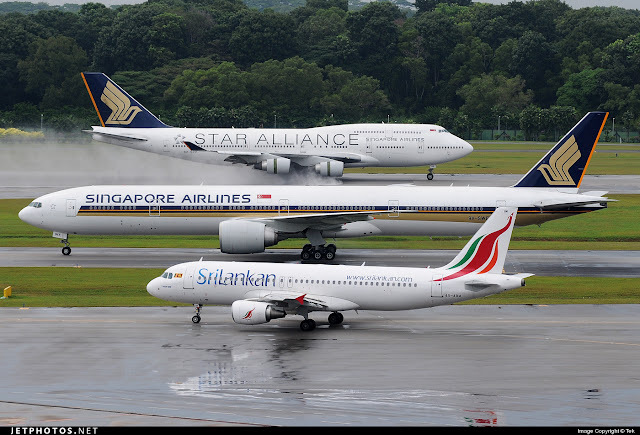 When I was looking for direct flights to Sri Lanka from Singapore, there were only three options: Singapore Airlines, Emirates, and Sri Lankan Airlines. With Sri Lankan being the only option to accumulate points and status credits through my Qantas frequent flyer membership and the Oneworld Alliance. it was the logical choice. Sri Lankan Airlines is serviced out of Changi Airport Terminal 3. Business class passengers have a dedicated check-in counter and are given a lounge invitation to the Dnata Lounge. The set up in the lounge is relatively basic, and the food is not fantastic, but given that we were on a 9:45am flight it was still nice to have somewhere quiet to put your feet up while waiting for boarding. The flight time from Singapore to Colombo is approximately 3 hours and 50 minutes, and the aircraft we boarded was an Airbus A320. I immediately liked the colour scheme and the seat configuration (2-2, single aisle) of the business class cabin, which were done up in beige with muted mint green touches. Upon being seated, we were offered a welcome drink of juice. The seat does not recline to a fully flat bed, but given the short flight time, I did not think this was an issue at all. The seat width was comfortable, and there was plenty of leg room. The in-flight entertainment system has movies and TV shows on demand, and I thought the selection was very good with plenty of films which I wanted to watch but couldn't possibly finish during the short flight: The Imitation Game, The Theory of Everything, Birdman, Macfarland, USA and more. In addition to Hollywood, there is a selection of International films and a kids movies category. The TV screen is not embedded in the seat in front of you, but is instead one that you have to pull out of your arm rest. The negative is that the screen can get in the way of your meal tray! If you have special dietary requirements, you can pre-order meals (including kosher, vegan and gluten-free meals) online before your flight. Otherwise, once on board you can choose from four options of main courses from the menu. To get into the spirit of our Sri Lankan holiday, I opted for the Sri Lankan style fish curry with roti prata. The hubby opted for nasi goreng. I was pleasantly surprised by how good my meal was. I was expecting the roti prata to be tough and rubbery but it was soft and fluffy. The fish curry was pretty excellent too - one of the best airplane meals I've had in a long time. The service was good, but lacked some finesse when compared with other Asian and Middle-Eastern carriers. This was made apparent when we landed at immigration without being given immigration forms (which I would've expected the cabin staff to hand out so we could pre-fill them before arrival). First glimpse of Sri Lanka! Overall, the flight was smooth and the attractive pricing point of business class makes Sri Lankan Airlines a great option when travelling to Colombo from within the Asian region. The flight schedules for return trips between Singapore and Colombo are slightly annoying in that if you fly on any of the carriers offering direct, non-stop flights, you will be faced with at least one late night flight. To avoid this, you can do what we did - buy one-way tickets from different airlines at your desired departure times. It will cost slightly more, but I think it's worth not having to be at the airport in the early hours of the morning. Sri Lankan Airlines is a member of Oneworld, so you can credit the miles to any of the Oneworld airline memberships. Alternatively, you could sign up to Sri Lankan's own frequent flyer programme, FlySmiLes.